My facial hair does not reach this level of awesome. That is both a relief, and tragic. Lets do some good old fashioned soul-baring, inspired by The Militant Baker. I have Polycystic Ovary Syndrome. It can mean a lot of different things to different people. To me it means I keep a closer eye on my heart health and blood sugar, both of which are currently normal. It may have contributed to my current size. PCOS correlates to the depression that I have dealt with off and on since I was a teen. I was told I may be infertile when I was diagnosed at 15. I was diagnosed when my mom and I realized my periods weren’t becoming regular as a teenager. With a little care, I’m lucky that I am as healthy as a horse. The jury is out as to whether fatness is a cause or effect things with PCOS, and frankly I only care about it academically. That same big horse is already out of the barn, and a fancy chestnut mare is she. Turns out, I’m probably not infertile. However, I’m all over the jump-straight-to-spoiling role of auntie, so I won’t be testing that theory. Other people may see actual cystic ovaries (although this is not guaranteed), heavy or absent periods, thyroid issues, thinning hair and acne and other skin issues. Symptoms vary from person to person. Symptoms may show up at puberty, like mine did, or may show up later in life. The biggest part of my PCOS that I deal with daily is the beard… I started growing facial hair at about 17. I’ve been super self-conscious of it since then, but turns out people generally don’t notice. Or they’re too polite to say so. Even so, I’ve tried almost everything to get rid of it. Most things I’ve tried have caused more skin irritation and acne than hair removal. I now reap the benefits of a laser hair removal groupon I used few years ago, and a constant supply of tweezers stashed strategically in the bathroom and in my purse. I’ve also made more peace with it and don’t worry about it as much anymore. Female facial hair can be a sign of hormonal imbalance, but it can also be normal human variation. I don’t discount the fact that the men in my family are impressively hairy. 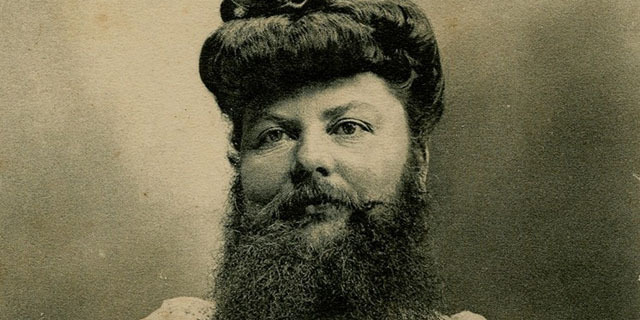 There are women who embrace their facial hair. I think that is awesome. While I like my face smooth, I don’t pretend that the preference is not a cultural thing. Mariam and Balpreet both look great. Keep in mind I, personally, find all these things important. You may enjoy (or tolerate) physical activity because of all, some, or none of these reasons. Or you may not. I love a Health at Every Size mentality and will continue to talk about it (a lot), but health is not a moral imperative. Health is not a ticket to basic dignity and respect. I’m at a place where I’m doing things that I enjoy, that improve my health. This does not make me better or worse than anyone else. I told him I understood his concerns, but that long term weight loss is not statistically likely. And that my health can improve significantly from improved diet and activity that I enjoy. We went a couple rounds, with me citing these studies, and him citing his book of clients. I’m thrilled for his clients. They have achieved something that they wanted. But only one client he showed me had maintained the weight loss past five years, which seems to correlate with the statistics I cited in our conversation. Her goals are not my goals, and those odds are not odds I’m interested in. We stopped debating when I said, “Here’s the deal. If I lose weight, you get a giant gold star and a letter from me for your book. If I don’t lose weight, but I do gain strength and reach my other goals, then we still both win.” We came to a truce and he sent me out for a warm-up of my choice. I like the elliptical machine. We then did barbell squats, leg presses, leg extensions, and wall sits. And by we, I mean I. He pushed me to do reps, and we laughed as my legs shook. We gossiped and talked a little smack. It was glorious. I’m sore today, but I can’t wait to go back next week, after doula training. While Rob and I don’t see eye to eye about weight, I have an ally in my corner because I was able to advocate for myself and put down boundaries about what I wanted out of my personal training. Amy, What About That Ted Talk? I’ve had a bunch of people ask me about this video. Peter Attia talks about fat stigma, diabetes, and alternate theories of why people are fat. There is pretty good science about the idea that there are reasons that lead to obesity other than the “two whole cakes” theory, which states (approximately) that all fat people are somehow sneaking two whole cakes daily. He talked about one of those suggested reasons. The idea is that insulin resistance causes obesity, not the other way around. This is promising. I love that people are looking at their preconceived notions about fat people and talking about them publicly. I also support the fact that he pointed out that there are a good number of obese people that are metabolically healthy, and thin people with metabolic syndrome. These are often tied to diet and exercise, hence why I follow a HAES® mentality for those that WANT to improve their health. However, for those people who are fat and metabolically healthy- that means that they aren’t showing signs of insulin resistance. I think that needed to be more than a passing note in his lecture, because if they aren’t showing symptoms of insulin resistance, then why are they fat? I fall into this category. I don’t agree with a moving target for stigma. But I Can’t ‘Move Joyfully’ Without Workout Clothes! I know that many large women have trouble finding workout clothes in their size. They either can’t find it or can’t afford it. I remember wanting to start working out a few year ago, having nothing appropriate to wear, and going to Target, where the only pants and shirts I could find were just a smidge too small, but what else was I going to do? Well, I’m older, wiser, and love online shopping. Of course, I’d love it more if I could shop in stores, but I’ll take what I can get for the moment. In stores, Old Navy carries workout gear through an XXL. Their regular sizing is generous, and an XXL will likely fit through a 22/24, even though they’re marked as 20. They have capris, yoga pants, sports bras, tanks, and t-shirts, and carry compression gear. Online, they carry sizes 18W-30W in their plus section. While the selection is a bit smaller and the fat-tax is pretty generous, they carry all styles of gear at decent prices. I went on a spree a few years ago, so Old Navy is what I wear, and I find it pretty darn comfortable! You’d never know it by their pathetic in-store offerings, but Target carries some decent women’s workout clothes online. Unfortunately, their search function is difficult to use. Some good sleuthing will find you good deals, though. Woman Within has cemented a place in the online shopping experience. It is great for basics, has excellent prices, and they consistently offer up to a size 40W. Workout pants, skirts, shirts, comfortable swimsuits, and sports bras are available. Junonia is synonymous with classic plus size activewear. They’re a little pricier, but they’re known for quality and a variety of clothing to cover every activity from skiing to golfing to swimming to tennis to running. Their sizing goes up to a 6x/40W in some pieces. I’ve heard great reviews of Sparkle Skirts from the fitness group I’m a part of. With pockets, compression shorts, and as finely obnoxious of a print as I could ask for, I’m excited to order one in the future. Sparkle Skirts offers sizing up to a 3x. I Want to Move It, Move It? Maybe someday I’ll be this awesome. Last week, I was invited to go to an archery range with a new friend while I was in Seattle. I didn’t know what to expect. 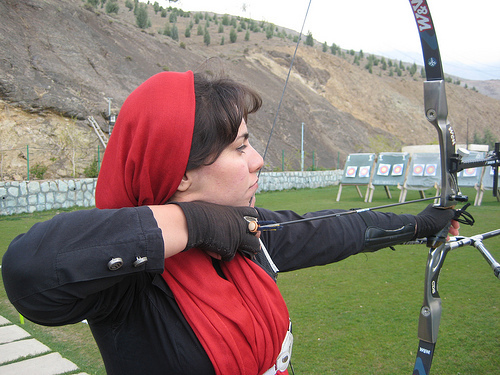 I was nervous; arrows are rumored to be pointy, and I’m not always known for my physical grace. I shoot handguns a few times a year, but this is completely different. I ended up having a great time! We shot for about two hours. It was calming to focus on exactly how to hold my body for the next shot. When I got a good shot it was exciting, and every few minutes someone yells “Clear!” and I’d walk down to the end of the lane and pull my arrows out of my target (or from near my target). I loved focusing on where my arms were, my posture, my footing, and exactly what level of strength balance were required. I had a pretty righteous crick in my neck from sleeping in hostel beds, and it felt great every time I pulled the bowstring back and brought my shoulder blades together. It may not have been awfully strenuous, but I was moving for the whole two hours. I’ve looked up an archery range close to me, and I look forward to visiting it soon. Movement and activity are important for health. Traditionally, we look at movement and activity as exercise- often a punishment for the outrageous sin of eating. When we remove the goal of weight loss, movement and activity are important for other reasons. Regular physical activity improves mood, blood lipid levels, sleep, blood pressure, blood sugar levels, and energy levels. We breathe better and our cardiovascular system responds quicker and recovers faster. When you find something you enjoy, it is a great stress reliever, too. I haven’t always loved going out and doing physical things, because exercise felt like a chore for so long. A few years ago, I removed the ‘should’ from activity. It took a while, but I started wanting to fit some activity into my life. I feel better when I move. I have less pain, breathe better, and recover faster when I have to hustle somewhere. Also, I’m having a lot of fun! Joyful movement is all about finding something you love. I love swimming, elliptical machines, biking short distances, weight lifting, chasing my friends’ kids, and I just may love archery now, too. I have a game on my phone, Ingress, that means I walk around for hours stopping near public art and landmarks looking suspicious (It is a sort of highly technical multi-player, never-ending version of capture the flag that uses Google’s maps and your GPS). Jimbo Pelligrene found something he loves! I’m still discovering things I like to do, and how to fit them into my schedule, especially as my schedule is so variable. I like working out at a gym; not everyone does. I got a deal online for a month’s membership and some personal training sessions at a local gym. I’m looking forward to getting to know their machines and find out how I can improve my ability to “throw things around.” I love my strength. While you can almost always find me in a dress, and often find me in heels and makeup, I still love the opportunity to help carry a couch, or climb a tree, or move some boxes. I have friends who love to dance, love to run, love yoga, love to garden… When you remove the temptation to judge activity solely by its calorie-burning attributes, it really is all about what you like. Movement has also been an opportunity to pay attention to how I feel. For a looong time, I assumed that I got winded before my muscles ever even noticed what was going on, and my feet hurt, because I was ‘out of shape.’ Turns out, I have asthma (I thought I got rid of it as a kid), a pretty impressive heel spur, and a decent case of plantar fasciitis (Those translate roughly to “perpetually walking on spikes”). I got an inhaler, and it works like magic! I have orthotics coming in next week, and I can’t wait to be able to step up my game, physically. I’ll have to figure out how to fit them in my dressier shoes, but I expect to feel quite a bit better on my feet. That means I can do more walking with less pain, which is so great when I like to play Ingress and wander around on foot for hours. Paying attention to yourself as you become more active means you can understand your own needs better. The training was amazing. Linda Bacon and Lucy Aphramor were brilliant. There were over 50 people at the training, and about half of them were dietitians. There were people from as far away as Australia. Everyone in the room believe that fat people have the same health goals as thin people. We covered a few things I have thought about before in conjunction with Health at Every Size®, but never quite connected in the same way. We talked about how health is multi-dimensional- there is physical health, emotional health, spiritual health, social health- you can’t hold one above the others and expect to feel well. I mentioned First, Do No Harm in my previous post. I’ve talked in classes before about the futility of prescribing weight loss to patients, as it almost inevitably results in weight rebounding and worse health than just being fat. I’ve talked about how our current medical model creates a barrier to treatment. However, Linda and Lucy clarified and condensed these issues. These are all issues of medical ethics. Providers, by and by large, get into the business to help people. But when providers are taught to prescribe weight loss, and that weight is a result of laziness and a lack of willpower, they are harming the vast majority of their patients. That is simply unethical. If providers knew and shared the facts about long term weight loss attempt results, we wouldn’t recommend it anymore, and more and more, people wouldn’t consent to trying it. In the next few months, I’m setting up a forum to create a conversation between fat patients in Denver and Denver care providers. Hopefully we can address some of these barriers to quality care. We talked about the fact that being fat can exacerbate some conditions. Being fat can impact joint pain, diabetes, and heart disease. However, is weight loss necessary? Experiencing one of these conditions doesn’t make weight loss any more reasonable of a goal. Also, there are things that you can do for any condition that doesn’t include such drastic measures with such poor results. While it is clear that eating a varied, enjoyable, quality diet and physical activity can improve diabetes and heart disease regardless of weight loss, joint pain is harder to assess. Eating low-inflammatory foods and getting enough sleep can improve joint pain, and sometimes physical therapy can improve symptoms, without weight loss. Thin people with diabetes, heart disease, and joint pain are given suggestions to improve their health that don’t include weight loss. The last thing that I took away from this training a reminder of the community available to me. I was reminded of the HAES Community, where you can find researches, authors, activists, care providers, and more in your community. I heard more about ASDAH, who actually owns the HAES trademark. They have another listing of health professionals that work within a HAES mentality. They hold annual conferences, do lots of work in the community, and have excellent educational resources on their site. I heard of local HAES activists, and left having met many many awesome people. I had an amazing day at the HAES® training. I always wondered what kind of people earnestly say “I’m just so excited to be here!” People like me, I guess. I think there are over 50 people in this room, just eager for information about how to teach their patients, coworkers, and community how to better support health for people of all sizes. One trainer is from the UK, and participants are from as far away as Australia. There are quite a few registered dietitians in the room getting their eyes opened about the kinds of bigotry and hurdles fat people face, in healthcare and the world at large. The gal sitting next to me went wide-eyed when I said that I can’t do things like zip lines or indoor skydiving because business owners don’t bother to make those activities available and safe for me. My money isn’t worth it to them. I didn’t talk about the fact that I carry-on my luggage so that the airlines don’t lose my clothes- my clothes are far too precious to me to let them out of my sight, because they’re far less replaceable than straight-sized clothes. Or that I have to be conscious of how I am perceived in job interviews, or at the airlines, because I could lose a job or get booted from a flight. I didn’t mention that I got turned down for better health insurance last week. And that I have to call ahead to new doctors to make sure they’ll treat me like a human being instead of a disease, including having equipment that will accommodate my body. People in the community call not having to deal with these issues “thin privilege”. The dietitian I was talking to said “well, you chose to go out and deal with these things anyway”. Well, yeah. I deserve to do fun things, have nice things, dress well, and be treated well. The fact that that doesn’t happen is fully fixable, and I’m just angry enough to cause trouble until things change. Headed to Health at Every Size® Training! Today I start the Health at Every Size® fascilitator training, and I am super excited about it. I’ll spend a week learning how to best teach people in my community (that means you!) about the concepts of HAES. Until then, here is an overview. The HAES concept doesn’t erase that people of different size may face different health concerns. It does acknowledge that long term weight loss is nearly impossible, and we need to address health concerns with people where they are, not when they reach an ideal body. There are people who lose significant amounts of weight and keep it off, but that is a very, very small minority of people; different studies show no more than 2-5% of dieters are able to keep off significant amounts of weight for five years. There is no weight loss method that has a decent success rate (which explains why nobody publicizes their results). Weight loss attempts usually lead to regain, and often lead to weight gain above and beyond the loss. This weight cycling is more damaging than just being fat. In a culture where people often start trying to lose weight in childhood, it means that they are weight cycling again and again and again. The obesity epidemic panic also does a disservice to thin folks. Culturally, we assume that thin people are healthy, and don’t talk about how being inactive can impact their health, or that thin people need to be screened for the diseases and conditions that we associate with obesity, like high blood pressure, heart disease, and diabetes. When we teach assumptions about what kind of people get these diseases, we harm those outside of that demographic by reducing their awareness of their own personal risks. These assumptions are also found in health care providers, reducing the quality of care that both fat and thin people recieve. Better than focusing on weight, what we can do is focus on health. While changing eating habits and exercising may not impact weight, they clearly impact health. If we focus on changing eating habits, and creating opportunities for enjoyable movement, we see that regardless of weight, health markers improve. This means lipid levels, blood pressure, resting and exercising pulse rate, blood sugar levels, blood insulin levels- all markers of physical health. This is an approach that works for thin and fat people. A big part of this approach is self-acceptance. There is a lot of stress associated with thinking that you’re failing at losing weight. That stress, combined with other life stresses, snowball into a lot of the diseases we currently consider ‘weight-related’*. Many people have dieted and exercised in ways that have moved them out of touch with their bodies. I have dieted and exercised in ways that got me way out of touch with my body. But understanding what your body needs doesn’t go away entirely, it just gets shouted over so much it is hard to hear. HAES promotes intuitive eating, the idea that when you remove foods from being off-limits, and pay attention to how foods make you feel, you will make far more healthy choices than when we are stuck in a good food/bad food dieting denial loop. I know what foods make me feel good, what foods don’t, and when I want a little ice cream, I don’t finish off the carton because I’m afraid of my diet tomorrow, and that I’ll never again remember what it tastes like. HAES also promotes enjoyable activity. Find something you like doing, because movement, however you define it, benefits health. Physical activity, whether difficult or easy, improves mood, sleep, and all the other health markers talked about earlier. *See Robert Sapolsky’s book, Why Zebras Don’t Get Ulcers.